I made these beautiful juniper bundles with wildcrafted eastern red cedar (Juniperus virginiana). This tree is aromatic with reddish wood that gives off the scent of cedar chests. Cedar is traditionally associated with purification and protection. I harvested this juniper from an area I know was not treated with chemicals and hand crafted each herb bundle. The eastern red cedar is also known as red cedar and eastern juniper. All sizes are approximate. To use a smudge stick light the end, gently blow out the flame when you feel it's good and lit. Slowly wave the herb bundle in circular motions as you move around the room, person, or object. Use a fire safe dish to catch any fallen ash. When you are done extinguish your herb bundle by tamping it in a fire safe bowl. 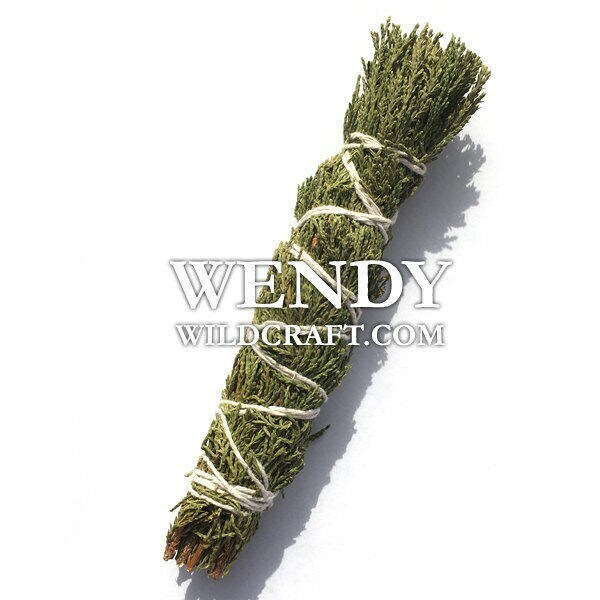 You can also cut this bundle up and use it as a loose herbal incense over charcoal. Color of smudge sticks may vary. Item arrived sooner than expected! Thank you, will be ordering again! Perfect! I can't wait to use it! Just what I needed! Perfect! !